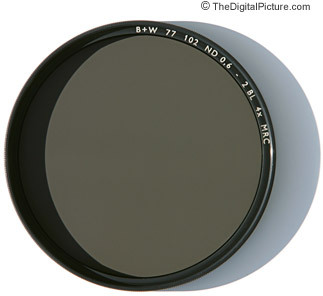 When you want less light reaching your sensor, you want a neutral density filter. Want to skip straight to the recommended neutral density filters? Just click here. As you probably figured out from my opening sentence, a neutral density filter reduces the amount light reaching the camera's imaging sensor. A key point is that the light is evenly reduced across the color spectrum and this "neutral" light reduction is applied evenly across the entire frame. Why would one want less light reaching the sensor? Preventing light from reaching the camera's imaging sensor sounds counterintuitive. We frequently pay much more money for (and go to a greater effort to carry) wider aperture lenses to allow more light to reach the sensor. Why would you want to pay money for something that reduces the light reaching your sensor? There are some very good reasons. One of the reasons to use a wide aperture lens is for the shallow depth of field effect they are able to deliver. But, under bright light such as direct sunlight, a camera's fastest shutter speed may not be fast enough to prevent overexposure. The fastest aperture available on some DSLR cameras is 1/4000 sec. and even 1/8000 sec shutter speeds found on the best cameras is not fast enough to shoot at an f/1.2 aperture under full sun. Add a neutral density filter to knock the light down, allowing use of those wide apertures even in direct sunlight. Videographers frequently want to use a specific, relatively slow shutter speed (such as 1/60 second) but still want the shallow depth of field provided by wide apertures. Therefore, once again, a neutral density filter is required to prevent overexposed video capture in bright light. The annual local fireworks display gives me easy access to a very nice display of color. The tiny points of light from the fireworks are in one place only momentarily. They move fast and you want to capture the motion of those tiny points of light to make an interesting picture. Thus, exposure is determined by the aperture. Fireworks are also very bright. So bright that, from my close vantage point, they require a very narrow f/16 aperture to avoid overexposure. The f/16 aperture is narrower than the Diffraction-Limited Aperture (DLA) of all current Canon EOS DSLR cameras. This means that my f/16 fireworks are not as sharp as I wish. Adding a 2-stop ND filter allows me to use f/8 for excellent image sharpness. 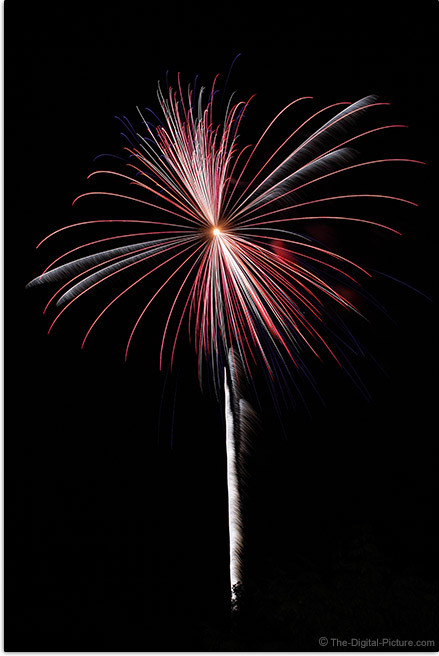 Not dissimilar to the fireworks example I just used, neutral density filters can be used to allow motion blur via a longer exposure duration. Sometimes, we do not want to stop subject motion and a longer exposure is the goal. Landscape photographers make up the majority of the group seeking longer exposure durations, with water and clouds typically being the target subject for this technique. Cars are another popular subject for ND filter motion blurs. OK, I lost many of you on this one. We older photographers remember the film days when you had only the loaded film speed ASA (ISO) to use. If ASA 400 speed film was in your camera, you either had to unload and waste the remaining exposures (film cost us money) or you had to do a modestly complicated unload/reload process to get ASA 100 film loaded for outdoor daylight use. Alternatively, a neutral density filter could be used to get the equivalent amount of light reduction (2 stops in this example), leaving the ASA 400 film in the camera. Basically, film users can use ND filters to allow use of high speed film under bright daylight. Note that using long exposures when heat waves are present can result in not-sharp images. Each stop in light reduction represents 1/2 as much light reaching the camera's sensor. This creates the "X" factor. Yes, 1000x is an incredible amount of light to block. Which ND filter density should be selected? If you want to get strong cloud and water motion blur under full sunlight, you want 8-10 stops of light reduction. Otherwise, the right amount of light reduction is much harder for me to recommend. My advice is to use a lens you have now to determine what your base (without-ND-filter) exposure is. Then, determine how many stops away your desired exposure is. Plan on needing at least a 1/4 second exposure to blur moderately-fast moving water. There are numerous ND filters capable of blocking upwards of 10 stops of light. These are sometimes referred to as "Black Filters" – reflecting their appearance – and what you see when looking through the viewfinder. While amazing, these filters are not without their drawbacks. Perhaps the most significant drawback of blocking 8 to 10 stops of light with the filters available today is the resulting color tone issue. While these filters attempt to block all wavelengths of visible light evenly, the results do not always reflect this. A warm or cool tone is the expected result of using such strong filtration. White balancing during post processing is generally the answer to this problem. Another extreme ND filter issue is focusing and composing. It is hard to do such with a black viewfinder. Typically, the filter will need to be removed to compose and focus the image and the reinstalled for the photo. Variable density ND filters are a good answer to this issue (more info about these below). In the film days, we had a different problem when using extreme ND filters – reciprocity failure of the film itself. I usually do not recommend stacking filters, but even with so many ND filter density options available, you may need one that is not available. Or perhaps more likely, you may need one that is not in your kit. Stacking two ND filters will give you the sum of the light reduction capabilities of the individual filters. Stacking a 2-stop and a 6-stop filter will yield an 8-stop ND filter. Better yet can be stacking a circular polarizing filter to an ND filter. The CP filter can add 1 to 2 stops of light reduction and can add its own qualities to the image. When stacking filters, the overall filter ring depth can get thick. Mechanical vignetting can be the result, especially at wider focal lengths. Be aware of corners going dark when stacking. Several manufacturers including Singh-Ray and Tiffen offer variable density filters. These filters typically offer a 2-8 or 10 stop density range. Essentially these solutions utilize two linear polarizer filters stacked together. By rotating the one filter, the amount of light reduction can be adjusted. These filters are especially easy to use even at strong density levels. Simply rotate the filter to a 2 stop density, focus and compose, then adjust back up to a high density. While a single filter with a wide range of densities sounds like the ultimate solution, variable density filters have some drawbacks and limitations. One limitation is the requisite ring thickness of stacked filters. I was getting hard mechanical vignetting at focal lengths wider than approximtely 40mm on a full frame body with one of the "slim" variable ND solutions. Since I primarily wanted to use the filter at focal lengths wider than 40mm, this solution did not work for me. Another drawback is uneven light reduction resulting in a cross-hatch pattern seen in some images at the upper end of these filters' light reduction capabilities. And cost is a definite drawback for the high quality versions of these filters. What is the best neutral density filter? As usual, there is more than one manufacturer offering high quality neutral density filters. And once again, I have placed my trust in Schneider Optics B+W MRC filters. The quality and performance of B+W MRC filters, with high quality brass rings and excellent glass, place them among the best available. I also trust Hoya's best lines as well. B+W neutral density filter rings come in two thicknesses, standard F-Pro and the slimmer XS-Pro. The standard thickness is the same as the standard UV filter thickness. For most wide angle lenses (in general, wider than 40mm), with and without standard UV filter test results are available in the vignetting tool (look for the second-to-last focal length option). This tool allows comparison to determine if the standard filter depth causes light to be blocked from reaching the corners of the imaging sensor – causing vignetting. The standard thickness filter rings add very little or no vignetting to most lenses even on a full frame camera. If using a full frame lens on an APS-C format body, the standard filter ring should work fine for you. A much better option for a slimmer filter ring is B+W's flagship XS-Pro line. As mentioned above, the Nano version of this filter line includes B+W's best 8-layer MRC Nano coating. Though not quite as slim as the slim filter rings, the XS-Pro rings are slimmer than the standard ring thickness. Lens caps can be attached to them. The XS-Pro line is my easy filter choice when standard thickness filter rings cause vignetting. Relatively new to the market, Breakthrough Photography boasts that their neutral density filters are the "world’s sharpest [and] most color neutral". Many ND (and circular polarizer) filters impart a color cast to images captured with the filter in place and being color-neutral is a true advantage. In addition to being very color neutral, Breakthrough’s X4 ND filters are well-designed, featuring a brass CNC machined traction frame, optically excellent and have proven rugged and reliable for me, making their recommendation a very easy one. Filters are rather easy to counterfeit; therefore, I suggest purchasing them only from a reputable retailer to insure that you are getting the filter you expect. Those retailers I list below are my top recommendations (and my own choice), though care must be taken if using a 3rd party reseller on Amazon. Neutral density filters prevent an even, designated amount of all visible wavelengths of light from reaching your camera's imaging sensor. Use this accessory to extend your exposure times. Longer exposures facilitate use of a wider aperture that may be desirable for image quality, depth of field, and/or camera shutter speed capability limitations. Longer exposures are very frequently desired for adding motion blur to an image. ND filters are a valuable part of a photography kit and I often have at least one in the bag.